After generating the majority of global growth since the financial crisis, the BRICS countries and other major emerging-market economies are experiencing a marked slowdown, with the possible exception of India. Advanced economies are even less buoyant. While the US economy is showing strength recently, nearly all of Europe as well as Japan, Canada, and possibly even Australia are expanding at less than 2% – many barely more than 1% – despite the application of years of extraordinary monetary stimulus in the Eurozone and Japan. Monetary policy is near the zero lower bound in the Eurozone, Japan, and the US, with interest rates either explicitly or effectively negative while inflation is negligible. 6 Yet investment and output remain sluggish, leading some observers to believe that these economies have entered an extended period of secular stagnation 7– a chronic propensity to grow slowly – weighed down by accumulated debt and changing demographics. See the United Nations Population Fund (UNFPA) perspective on demographic changes and inclusive growth (Box 1), as well as Box 2 on secular stagnation and long-term investment, contributed by McKinsey Global Institute. These demographic megatrends affect almost all aspects of social and economic development, including production and consumption, environmental sustainability, and access to health, education, housing, sanitation, water, food, and energy.1-2 They also affect employment and social protection, including pensions.1-3 The world’s least-developed countries already confront a major employment challenge that will be multiplied as the number of young people entering the labor market grows.1-4 By contrast, the more advanced economies are experiencing rapid aging and are projected to see a shrinking of the working-age population. Sustained and sustainable economic growth therefore depends on labor productivity growth. Promoting this is a question of growth-oriented macroeconomic policies and productive investments in the real economy, as well as adequate investment in technological advancements and human capital. Harnessing the capabilities of young people will help produce a demographic dividend. Empowerment: Increase investment in family planning and other maternal and child-health programs; enact and enforce laws to prevent early marriage; expand coverage of basic newborn, infant, and child-health services. Education: Invest in the education system to increase the number and quality of educational opportunities available; enact laws to mandate extended schooling for longer periods of time and equally for females and males; promote female education to increase enrollment and attainment; prioritize measures that increase the number of females who complete secondary education; and promote informal education programs for women who are out of school either because of age or family obligations. For example, microfinance programs can offer adult women micro-credits for pursuing education courses, which can include subjects such as hygiene, nutrition, and family planning. Employment: Invest in economic sectors that can create significant employment opportunities for the youth; ensure that new jobs are progressively created in more knowledge-intensive sectors with greater added value as the educational quality of the population increases; expand vocational training opportunities to ensure that students graduate with skills useful for the current work environment in addition to general know-how. The Framework outlined in this Report describes many of these recommendations, though the focus on youth will be critical. These policies can enable countries to realize a first and second demographic dividend, promote economic growth, and encourage greater social cohesion. 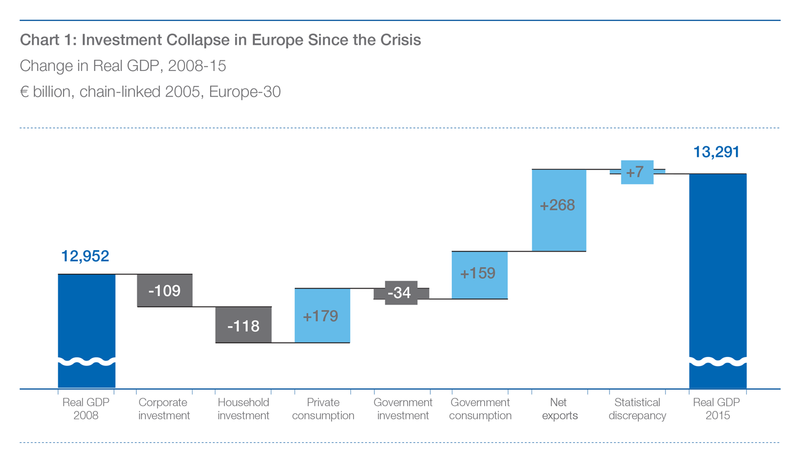 However, long-term investment was already falling in Europe for decades before the crisis. In Germany, for instance, net investment has declined from 12% of GDP in 1970 to only 3% today (Chart 2).2-1 The decline is evident in public, business, and residential investment. Public investment is down in both the United States and Europe since the crisis, despite ultra-low interest rates, due to a shortfall in demand. Gross business investment in the United States may have recovered to long-term ranges, but net business investment has decreased from an average of 4.8% between 1960 and 2000 to only 2.8% in 2014. Household investment has collapsed to only 3% since the crisis and into 2014, barely up from its 2011 trough of 2.9%. A prolonged lack of investment causes real damage to the economy. In the short run – and as is becoming evident now, also in the mid-long run – low investment dampens demand, slowing growth and putting pressure on employment. In the long run, a lack of investment can hollow out the productive capacity of the economy. There are multiple links between slow investment and inclusiveness too – in both directions. Business investment largely follows demand.2-2 But higher-income households’ propensity to consume is significantly lower than that of lower-income households, who tend to spend what they get. When a growing share of national income goes toward capital gains and higher-income deciles, demand can be weak, and, with it, investment. Low investment can also negatively affect inclusiveness. On the asset side, a lack of investment opportunities pushes interest rates down and asset prices up, disproportionately benefiting high net-worth households while pushing, for instance, home ownership out of reach for many. On the income side, a good share of investment tends to be in construction activity – a sector that provides jobs and incomes for low-skilled segments of the population. And investment can drive productivity – and hence incomes – for all. Public investment could be encouraged by adjusting public accounting standards to capitalize such investments on the balance sheet and depreciate them over the life cycle of the assets. Further, adopting global best practices in project selection and delivery as well as management of existing assets could reduce the cost of public works by 40%. To stimulate business investment, the macroeconomic outlook and aggregate demand need to improve first. This has implications for both monetary and fiscal policy, but also for redistributive and pre-distributive policies that put money into the hands of those who spend. Unambiguous regulatory signals can trigger investment. For instance, clear carbon pricing pathways can encourage businesses to invest in energy and emissions saving products, services, and technologies. Governments have acted to stabilize housing markets and, thus, residential investment, with one notable omission: reform of urban land markets. The need for structural reform has become ever clearer after the financial crisis, and much has been said about cutting red tape in labor and product markets. Lesser attention seems to have been paid to rethinking the trade-offs involved in establishing urban land-use policies, zoning requirements, building codes, and the like, which can all weigh heavily on housing investment. Concerted effort, including many of the structural reforms described elsewhere in this Report, will be required to counter the long-term decline in investment that is hampering growth and inclusiveness. The prospect of secular stagnation is all the more worrisome because many countries have already been experiencing a secular dispersion of income and opportunity. While income inequality across countries has declined significantly over the past 20 years, it has grown markedly within a wide range of countries. 8 A combination of accelerating technological change, global integration, domestic deregulation, and immigration has been driving major changes in labor markets in most advanced countries. This has resulted in heightened dislocation, pressure on median wages, and insecurity, even though these countries have enhanced efficiency and overall national income. At the same time, many developing countries have had difficulty diffusing the benefits of rapid growth and industrialization widely enough to satisfy rising social expectations. In rich and poor countries alike, social inclusion is a burning political issue. The dawning Fourth Industrial Revolution appears likely to accelerate the forces of dispersion. Advanced technologies are being applied and combined in ways that promise to transform multiple industries and disintermediate many job categories. In particular, the increased sophistication and declining cost of industrial robots and algorithm-based artificial intelligence are projected to transform manufacturing and services in a variety of sectors over the next few decades, leading to major job losses in absolute and, quite possibly, net terms. Various factors have caused this decline, including the adoption of labor-saving technology, globalization of trade, pressure from financial markets to increase dividends, decline in workers’ bargaining power, and weakening of labor market institutions. In emerging economies, factors also include structural transformation toward more capital-intensive sectors and privatization of state-owned enterprises. While there is general agreement on this list of factors, different studies attribute different weights to each, and there are also variations between countries. How can this decline be reversed? The most recent ILO Global Wage Report observes that many countries have recently adopted or strengthened minimum wages in the face of growing wage inequality and declining labor shares.3-6 Since the early 1990s, nine OECD countries – the Czech Republic, Estonia, Ireland, Israel, Poland, the Slovak Republic, Slovenia, the United Kingdom, and, more recently, Germany – have adopted a statutory minimum wage. Many developing and emerging economies have also established or strengthened minimum wages. China adopted a minimum wage in 1994 and strengthened it in 2004; the Russian Federation complemented its national minimum wage with regional floors in 2007; Malaysia adopted a national minimum wage in 2013; and Brazil has consistently increased wage rates since 1995. In most cases, minimum wages have reduced wage inequality to some extent without causing any noticeable adverse effects on employment. The first report of the German minimum wage commission found, for example, that the number of workers with hourly wages below €8.5 has been reduced by about 3 million since the introduction of a national minimum wage in January 2015, while overall employment has continued to grow. Such positive outcomes, however, require that minimum wages be set at an adequate level – one that balances the needs of workers and their families with economic factors. Furthermore, minimum wages alone are no silver bullet for reducing high inequality, and must be complemented with other measures and conditions including social protection, enabling environment for sustainable enterprises, and collective bargaining power for workers to determine working conditions. Well-designed social protection systems are key for ensuring at least a basic level of income security and effective access to healthcare, which in turn help redress inequalities, reduce and prevent poverty, raise labor productivity, empower people to engage in decent work, and promote inclusive growth. Social impatience with stagnation and dispersion is spiking in advanced countries, as illustrated most dramatically by the recent Brexit vote and the US presidential campaign. This frustration is contributing to the growing popularity throughout the West of political parties that challenge the fundamental tenets of the post-war liberal international economic order, including trade liberalization, supranational governance, and expanded capital and labor mobility. At the same time, increasingly educated and connected populations in developing countries are raising their own demands for more widely-shared economic opportunity and prosperity. With fiscal space limited, 11 interest rates near zero, and demographic trends unfavorable in many advanced and middle-income countries, does the world economy indeed face a protracted period of relatively low growth? Will macroeconomics and demography determine the destiny of the world economy for the foreseeable future? As technological disruption accelerates in the Fourth Industrial Revolution, 13 how can societies organize themselves better to respond to the potential employment and other distributional effects? Are expanded transfer payments the only or primary solution, or can market mechanisms be developed to widen social participation in new forms of economic value creation? These questions beg the more fundamental one of whether a secular correction is required in the existing economic growth model. Is there need to alter the mental map of how policymakers conceptualize and enable national economic performance? Is there another way to cut the Gordian knot of slow growth and rising inequality, to turn the current vicious cycle of stagnation and dispersion into a virtuous one in which greater social inclusion and stronger and more sustainable growth reinforce each other? This is precisely what government, business, and other leaders from every region have been calling for. Over the past several years, a worldwide consensus has emerged on the need for a more inclusive growth and development model that would retain the key learnings of the past regarding the allocative efficiency of markets, importance of macroeconomic stability, and positive-sum game benefits of international specialization and exchange, yet would deliver far greater social participation in the process and benefits of growth. The United Nations 2030 Agenda and the Hangzhou G20 Leaders Communique are prominent recent examples. However, this global consensus is mainly directional rather than operational. International policy guidance has been selective and ad hoc. No larger, systemic framework has emerged to guide policymakers even as social frustration has continued to mount. Inclusive growth remains more a discussion topic than an action agenda. 1 International Monetary Fund World Economic Outlook, “Subdued Demand – Symptoms and Remedies” (October 2016): 19, https://www.imf.org/external/pubs/ft/weo/2016/02/pdf/text.pdf. 2 International Monetary Fund, “World Economic Outlook Update” (January 24, 2012), https://www.imf.org/external/pubs/ft/weo/2012/update/01/pdf/0112.pdf. 3 World Trade Organization, “World Trade Report” (2013): 55, https://www.wto.org/english/res_e/booksp_e/wtr13-2b_e.pdf. 4 World Trade Organization, “Trade in 2016 to Grow at Slowest Pace Since the Financial Crisis” (September 27, 2016), https://www.wto.org/english/news_e/pres16_e/pr779_e.htm. 6 European Central Bank, “Harmonised Long-Term Interest Rates for Convergence Assessment Purposes” (November 11, 2016), https://www.ecb.europa.eu/stats/money/long/html/index.en.html (last accessed December 8, 2016); Board of Governors of the Federal Reserve System, “Selected Interest Rates (Daily) - H.15,” https://www.federalreserve.gov/releases/h15/ (last accessed December 8, 2016); Bank of Japan, “Average Interest Rates Posted at Financial Institutions by Type of Deposit” (December 7, 2016), https://www.boj.or.jp/en/statistics/dl/depo/tento/te161207.pdf (last accessed 8 December 8, 2016); European Central Bank, “Inflation Dashboard,” https://www.ecb.europa.eu/stats/prices/hicp/html/inflation.en.html (last accessed December 8, 2016); StatBureau, “Countries by Inflation Rate 2016,” https://www.statbureau.org/en/countries-ranked-by-inflation-rate (last accessed December 8, 2016). 7 G. Eggertsson, N. Mehrotra, and L. Summers, “Secular Stagnation in the Open Economy,” American Economics Review, Papers and Proceedings 106, No. 5 (2016): 503-07; P. Krugman, “Four Observations on Secular Stagnation,” in Secular Stagnation: Facts, Causes and Cures, eds. Coen Teulings and Richard Baldwin (CEPR Press, 2014). 1-1 United Nations, “The World Population Prospects,” https://esa.un.org/unpd/wpp/publications/files/key_findings_wpp_2015.pdf. 1-2 “Population Dynamics in the Post-2015 Development Agenda: Report of the Global Thematic Consultation on Population Dynamics,” United Nations Population Fund, United Nations Department of Economic and Social Affairs, United Nations Human Settlements Programme, and International Organization for Migration (2013), https://www.iom.int/files/live/sites/iom/files/What-We-Do/docs/Outcome-Report-Pop-dynamic-and-post-2015-dev-agenda-14-March-2013.pdf. 1-3 M. Herrmann, Consequential Omissions: How Demography Shapes Development – Lessons from the MDGs for the SDGs (New York: UNFPA, 2015). 1-5 ILO and OCED, “The Labour Share in G20 Economies – Report Prepared for the G20 Employment Working Group Antalya, Turkey” (2015). 1-6 UN Economic Commission for Africa and African Union Commission, “Creating and Capitalizing on the Demographic Dividend for Africa” (2013), http://gatesinstitute.org/sites/default/files/Issues%20Paper%20-%20Creating%20and%20Capitalizing%20on%20the%20Demographic%20Dividend%20for%20Africa_En.pdf. 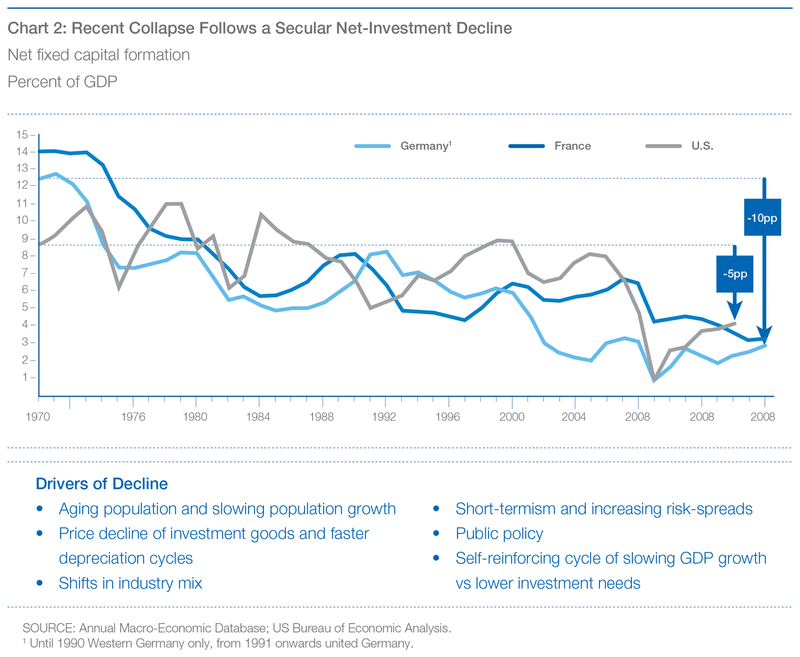 2-1 McKinsey Global Institute, “Secular Stagnation and Low Investment: Breaking the Vicious Cycle” (April 2016), http://www.mckinsey.com/global-themes/europe/secular-stagnation-and-low-investment-breaking-the-vicious-cycle. 2-2 McKinsey Global Institute, “A Window of Opportunity for Europe” (June 2015), http://www.mckinsey.com/global-themes/europe/a-window-of-opportunity-for-europe. 2-3 McKinsey Global Institute, “Bridging Global Infrastructure Gaps” (June 2016), http://www.mckinsey.com/industries/capital-projects-and-infrastructure/our-insights/bridging-global-infrastructure-gaps. 8 B. Milanovic, “Global Income Inequality in Numbers: In History and Now,” Global Policy 4, No. 2 (May 2013); United Nations Department of Economic and Social Affairs, Inequality Matters: World Social Situation 2013 (New York, 2013): 25, http://www.un.org/esa/socdev/documents/reports/InequalityMatters.pdf. 9 H.L. Sirkin, M. Zinser, and D. Hohner, “Made in America, Again: Why Manufacturing Will Return to the U.S.” (Boston Consulting Group, 2011), https://www.bcg.com/documents/file84471.pdf. 10 Tanya Powley, “China Becomes Largest Buyer of Industrial Robots,” Financial Times (June 1, 2014), https://www.ft.com/content/a5cca8c0-e70c-11e3-aa93-00144feabdc0. 3-1 L. Karabarbounis and B. Neiman, “The global decline of the labor share,” Quarterly Journal of Economics 129, No. 1 (2014): 61-103. 3-2 International Labour Office, “Global Wage Report 2012/13: Wages and equitable growth” (2012), http://www.ilo.org/wcmsp5/groups/public/@dgreports/@dcomm/@publ/documents/publication/wcms_194843.pdf. 3-3 K. Trapp, “Measuring the Labor Share of Developing Countries: Learning from Social Accounting Matrices,” WIDER Working Paper 2015/041, summary available at http://www1.wider.unu.edu/inequalityconf/sites/default/files/posters/Trapp-poster.pdf (accessed on October 25, 2016). 3-4 M. Jacobson and F. Occhino, “Labor’s Declining Share of Income and Rising Inequality” (Federal Reserve Bank of Cleveland, 2012), https://www.clevelandfed.org/newsroom-and-events/publications/economic-commentary/2012-economic-commentaries/ec-201213-labors-declining-share-of-income-and-rising-inequality.aspx. 3-5 M. Francese and C. Mulas-Granados, “Functional income distribution and its role in explaining inequality,” IMF Working Paper WP/15/244 (2015). 3-6 International Labour Office, “Global Wage Report 2016/17: Wage inequality in the workplace” (2016), http://www.ilo.org/wcmsp5/groups/public/---dgreports/---dcomm/---publ/documents/publication/wcms_537846.pdf. 11 While the financial crisis has left many countries with constrained fiscal space, there is room and justification for fiscal expansion in several economies, albeit of limited duration and scale. See “Escaping the Low Growth Trap: Effective Fiscal Initiatives, Avoiding Trade Pitfalls,” OECD Economic Outlook, November 2016. 12 T. Piketty, Capital in the Twenty-First Century (Paris and Cambridge, MA: Harvard University Press, 2013); G. Standing, The Corruption of Capitalism: Why Rentiers Thrive and Work Does Not Pay (London: Biteback Publishing, 2016). 13 See Klaus Schwab, “The Fourth Industrial Revolution” (World Economic Forum, 2016), https://www.weforum.org/about/the-fourth-industrial-revolution-by-klaus-schwab.